Sometimes it seems like it would be easier to brush the teeth of an alligator than that of your toddler. Toddlers aren’t into being still, and they definitely aren’t into being still when you’re trying to scrub their little toddler teeth. As much as we’d like to skip this particular battle at times, those little pearly whites need attention each and every day. We’re going to take a look at the toothbrushes available for baby. Here’s the deal: We did all the hard work so you don’t have to in order to find the best baby toothbrush! Keep reading to find the best tooth products made especially for baby. Some parents assume that baby teeth don’t matter. They fall out anyway, right? Wrong! Those first teeth are placeholders for adult teeth, and damaged baby teeth can lead to speech issues and a whole host of other problems. The truth is, taking care of your baby’s teeth should start long before they actually have any. Of course, you won’t use a toothbrush yet, but you can start cleaning baby’s gums with a soft cloth right away. The best method is to dampen the cloth and very lightly wipe down their gums. Doing this a couple times a day will keep bacteria from accumulating and damaging their first teeth as they come in. Wondering about toothpaste? It doesn’t come into the picture yet, but we’ll get there! At this point, water is the only safe thing to clean teeth and gums with. Starting your child’s dental routine right away will get them used to the procedure as they grow. Once those first little tooth-buds start popping through, you can move on to using a baby toothbrush. What’s Different About a Baby Toothbrush? You don’t teach your toddler to use utensils by handing him or her a full-size fork, do you? No way! You don’t want him to get hurt. By the same token, you need a toothbrush that is specially designed for baby. The bristles are soft and the head of the toothbrush is much smaller. The handle is shorter and significantly thicker. These features are important because a baby’s gums are very delicate and can be easily irritated. In addition, as your baby grows into a toddler his undeveloped fine motor skills require a thick-handled toothbrush that is easier for him to grasp. There is an abundance of different styles and types of toothbrushes made just for babies and toddlers. Finger brush for infants: When you start to see the tell-tale signs of that first tooth coming through such as drooling, swollen gums, and obvious discomfort, you may want to try a small rubber, thimble-like brush that fits over your finger. It has small, very soft bristles that are rubbed over the gums. Teething Toothbrush: A great in-between choice for baby is a toothbrush that does double-duty as a teether. With handles on both sides, even young babies can hold the brush easily while the soft bristles massage their sore gums. To help combat the drool with your teething toddler, look at the best baby bibs here. A First Baby Toothbrush: These toothbrushes are tiny versions of your own adult toothbrush. They have a small head so they can fit comfortably in your little one’s mouth, plus they have soft bristles to clean without causing pain. You can add a little dab of fluoride-free toothpaste onto the bristles to carefully clean those new teeth. Toddler Toothbrush: Though an older baby or toddler obviously isn’t ready to be in control of their own dental hygiene, they will eventually want to get in on the action. A short, thick handle with grips gives your little one the chance to have a turn before you finish the job. Fun Features: Don’t overlook the appeal of appearance. There are many toothbrushes that have bright, fun colors or even your child’s favorite cartoon character. Battery-operated toothbrushes are also an engaging option, especially for a reluctant participant. If you’re not sure which type of toothbrush is right for your child, you can always check out the package it comes in. These usually have an age range on them. This will tell you the months or years that each toothbrush is best suited to. Another thing to remember is that your child’s toothbrush should be changed at least as often as you change your own and sometimes more frequently. This means every three months, or as soon as the bristles begin to fray, whichever comes first. This will ensure that the toothbrush is cleaning their teeth properly. Flossing is another important part of your child’s tooth care, but you don’t need to worry about doing this until their teeth have grown enough to actually touch each other. Once there is contact between the two teeth, your child should begin to floss once a day to reduce the chances of cavities forming between their teeth. Toothpaste should not be used during the infancy stage. Water and soft bristles will do the trick at this age. It is generally recommended that children don’t use a fluoride toothpaste until they are between the ages of two and three. But what about that in-between stage? Let’s take a look. Fluoride Free Baby Toothpaste: Once those first baby teeth start erupting, usually around six months, you can begin to use a small amount of a fluoride free paste that is designed for babies. Stick with this until your child can rinse and spit on their own. Toddler or Children’s Toothpaste: When the child can rinse and spit on their own, usually between 24 and 36 months, they are ready to graduate to a toothpaste with a small amount of fluoride. These toothpastes also contain ingredients that help prevent the formation of plaque, prevent staining, and strengthen enamel. There are many different types and brands available. It may be fun for your little one to accompany you to the store to choose a toothbrush and toothpaste that are visually appealing to him or her. Making it fun will encourage excitement about using these important dental hygiene products. 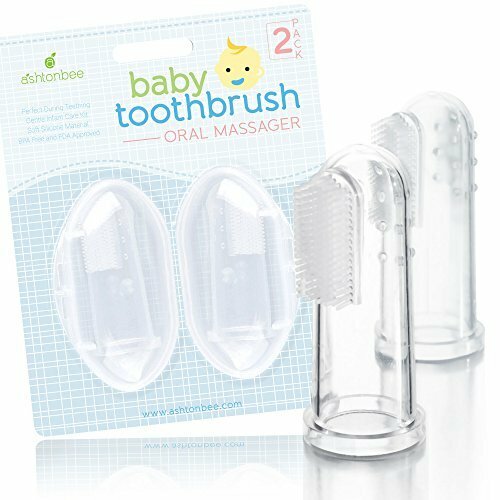 Ashtonbee‘s baby toothbrush is a soft silicone finger brush fits over any adult finger. 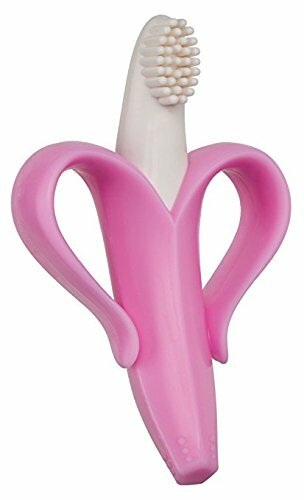 Made from BPA free, FDA approved materials, this oral massager is perfectly safe. It’s very easy to use, will clean baby’s gums while also getting them used to the sensation of brushing, and is also budget-friendly. Baby Banana‘s innovative teething toothbrush is made for babies aged 3-12 months. Being designed by a dental hygienist, It has safety in mind and is made of a bendable silicone. Baby Banana is BPA, phthalate, latex, and toxin free. The cost is also very budget-friendly. The design of the Jordan Step 1 brush is truly original. The handle of the toothbrush doubles as a teething ring. The texture makes it easy for babies and adults to grip. Another handy feature is the section of colored bristles that is a guide for how much toothpaste to use. This toothbrush is BPA and Phthalate free and non-toxic. The short neck of the brush also prevents injury. The bright colors are stimulating for baby, as well. This would have been a great toothbrush for my son who always wanted to carry his toothbrush around with him! The Jordan toothbrush is designed for just that. This Radius toothbrush is designed for children 18 months and older. It has super soft bristles that are made from a vegetable-based material. It is made from 100% BPA, phthalate, lead, and latex free materials. The colors are also FDA-approved. Everything is soft and smooth on this brush, allowing toddlers to safely brush their own teeth, with adult supervision of course! Another plus to the Totz toothbrush is that they come in packs of three. 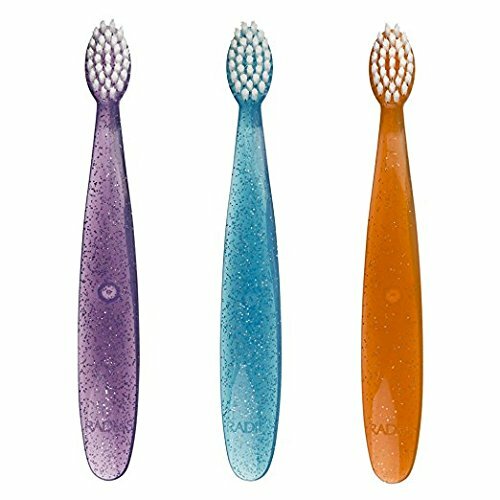 Actually stage five of a six-stage oral care system, this brush features bristles that go all the way around the brush as opposed to just one side. The 10 percent increase in bristles can also clean and massage baby’s gums and tongue as well as their teeth. It’s not only easier for baby to use but also allows caretakers to hit all the important spots without having to twist their wrist, which is important when you’re trying to wrangle a busy toddler! This unique brush is designed for fun. 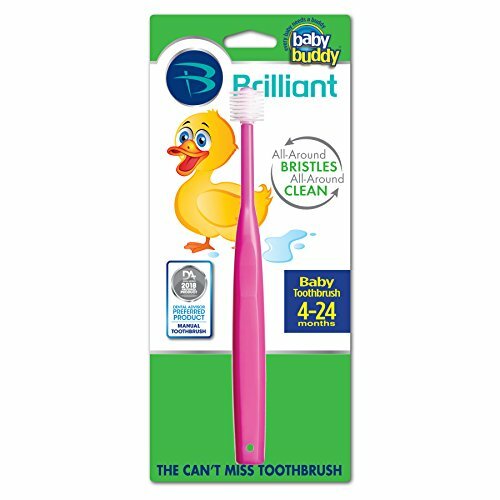 This Brush Baby toothbrush would have made life easier for life with our little girl who wanted to do everything herself, yet wanted no part of brushing her teeth! The large, rubber-gripped handle is perfect for little ones to hold securely. It also features an LED light that allows parents to get a good look at their little one’s teeth. It has micro-vibration technology that not only cleans teeth but also massages gums. It is free of BPA, lead, and other hazardous substances. While the price is a little more than a standard toothbrush, it does come with two replacement heads. This Jack N’ Jill toothpaste is all natural and safe to swallow. It has calendula, which soothes irritated gums, so it may be a good choice for little ones who are teething. It is free of fluoride, color, sugar, BPA, and preservatives. The flavors are organic too! 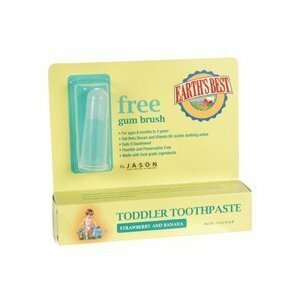 Natural Products Toddler fluoride free paste promotes strong, healthy teeth, and cleanses sensitive gums. We’ve narrowed down the best of the best for baby’s dental hygiene. Each product featured would be a valuable addition to your little one’s tooth-brushing routine. 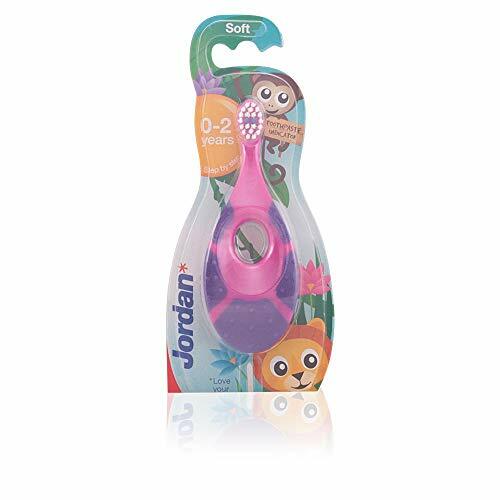 When it comes to the best toothbrush for your baby, the Jordan Step 1 stands out from the rest. With no discernable cons, it serves several different purposes, all in one handy tool. The Radius Totz is a perfect choice for those little toddler hands and teeth, while the Baby Buddy 360 Degree brush corners the market on 360-degree brushes! The market is slim on electric/rechargeable toothbrushes made especially for baby, but the Baby Sonic would be a good choice for a little one who needs a little extra stimulation to keep them engaged in the process. Of the toothpaste we looked at, the best choices, both natural, don’t contain any toxic or harmful ingredients. Thank you for visiting MyTinyTraveller.com. If our article has helped you make a decision about the best baby toothbrush for you, please click through to Amazon using one of our ‘Buy Now’ buttons. We are an Amazon Affiliate website and we keep our website running through the small commission we receive when you purchase your baby toothbrush from Amazon after visiting our site. There is no extra expense for you – the price is the same as if you went to Amazon directly. If you’re looking for more than the best baby toothbrush, please review our best stroller buyers guide.